Brussels public transport operator Stib is attempting crack down on passengers sharing their used tickets. Many people purchase 24-hour tickets, but do not need them for the full 24 hours. 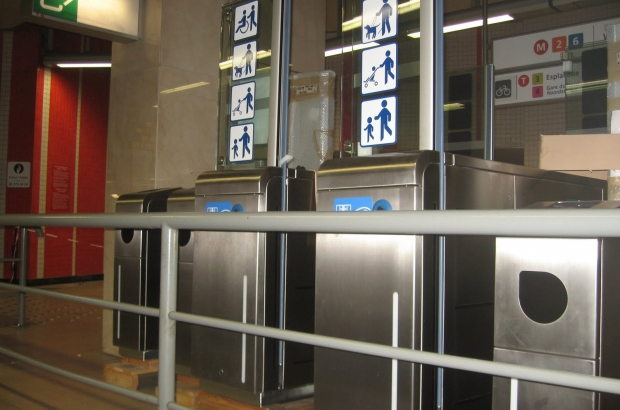 Often, they will leave the tickets at the gates of Stib stations and inform others through social media. Others can then use the still valid ticket for the remaining time, without having to purchase their own. According to Stib, this is fraud and could result in a fine of €408. However, names are not printed on the tickets, so this is difficult to enforce. The only way to catch those engaging in this fraudulent behaviour is if ticket inspectors see the physical ticket being passed on. It's not fraud. It is an unused ticket. There is NO fraud. It is like buying a meal at Quick and giving your drink and sandwich to someone because you couldn't finish it, and then having the Quick Police give you a fine for "fraud." I don't use social media, I simply give my card to someone at a ticket machine and walk away. It is polite, civilized, ethical. The "STIB Police" should be given mops and buckets and be ordered to clean the floors and pick up the trash, it is a better use of their time. What right do they have to give ANYONE a fine, it's crazy ! Paradox: your analogy is false. Sharing a hamburger has no relation to the fraudulent use of a ticket meant for one individual. RSGHARRIS: I completely disagree with you. What you could do is to have a system here someone places their unused card into a machine and then receives a CASH REFUND for the UNUSED time. Otherwise...find something else to do with your time.